Honor Flight Northland has made five flights to Washington, D.C., taking nearly 500 local veterans to war memorials and monuments to remember lost heroes. Now, a sixth flight is being planned. In the past, the flight was mainly for WWII veterans, but since there aren't many left, they have begun to take Vietnam and Korean War veterans as well. “They show up at three in the morning when we tell them not to be there before five,” said Durbin Keeney, former regional director of the Minnesota Assistance Council for Veterans. He was referring to the veterans who show up at the airport. “They are afraid of missing the flight," Keeney said. The Honor Flight out of Duluth began in 2010 with a few founders, including Judy Greske. She was on her way back from a flight in Rochester, where she was with the Gold Cross as a paramedic, in October of 2010 when she thought it would be a good idea to start the program in Duluth. “I saw the effect it had on the veterans, and it was really amazing; life-changing,” Greske said. A week later, she was involved in the Duluth group. Since she had been on a flight before, she had a lot of knowledge about what needed to be done. “There’s not a day that goes by that I don’t have something to do with Honor Flight,” Greske said. The Honor Flight program was developed for those who don’t have the means or opportunity to see the monuments on their own. Each flight has about 50 “guardians” to accompany the 80 to 100 veterans. The guardians ensure that each veteran is able to visit the memorials they wish to see, and to help them along the way. Many of the guardians are family members or friends of veterans who are attending the flight as well. Bill Lee signed up for the trip as one of these guardians to help his friend, but realizing that they had plenty of help, he ended up going as one of the veterans. Now 85 years old, Lee served during the end of WWII and the beginning of the Korean War. “I just went to help him, and he already had help,” said Lee, who attended the flight in October, after passing the opportunity once before. “I felt there was a lot more people more deserving than me. I stood the watch. I just did my duty." Lee was a Marine in both of the wars he served in. He recalls having his occupancy switched when they found how well he typed. Three days before a battle in Korea that took many lives, Lee was singled out and pulled out of the draft. He was set to go to Korea, but because they had changed his occupancy status, they took him for a different job. “Out of 18,000 men, two of us got pulled out of the draft,” Lee said. Remembering the sights in Washington, D.C., Lee recalls the Korean War Veterans Memorial with its inscription: “We thank you forever." But there were also some fun experiences on the trip, Lee said. He recalls having to use a wheelchair due to his medical issues. A tourist came up to him and took his picture. Lee then realized that the woman was with a large tour group, and all of them came over and took his picture. Lee said the return home was also exciting. When the veterans arrived home at 11 p.m., there was an entourage of people waiting for them. Lee recalls thinking that the entire police department must have been there, along with firemen, a game warden, family and friends of veterans, and more, all waiting to welcome them home. “I’ve had so many veterans tell me going on the trip was the best experience of their life,” Greske said. “I knew it was a good thing, and I knew it was an important thing, but I didn't realize the impact that it’d have on people’s lives." 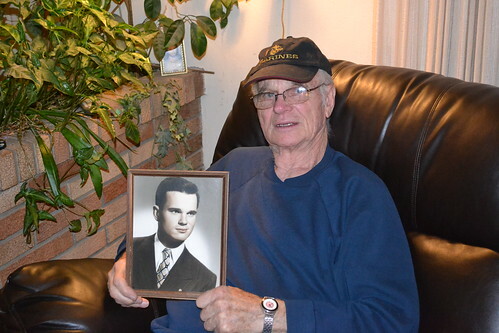 Keeney recalls one man who never spoke about the war to his children or anyone in his family. After going on an Honor Flight, he came home and finally told his children what it was like and what he had experienced. A few weeks later, he passed away. The Duluth Honor Flight recently received a $10,000 donation from Lakewood Legion Post 571. When the group decided to disband, they had some money left over, which they gave to multiple organizations, including the Honor Flight program, according to an article in the Duluth News Tribune. “They had some money they needed to distribute, so they gave it to us,” Greske said. She added that they were not planning on having any more flights, as each flight costs about $90,000. But with the new donation and a continuing interest, they'll take at least one more flight in 2013.